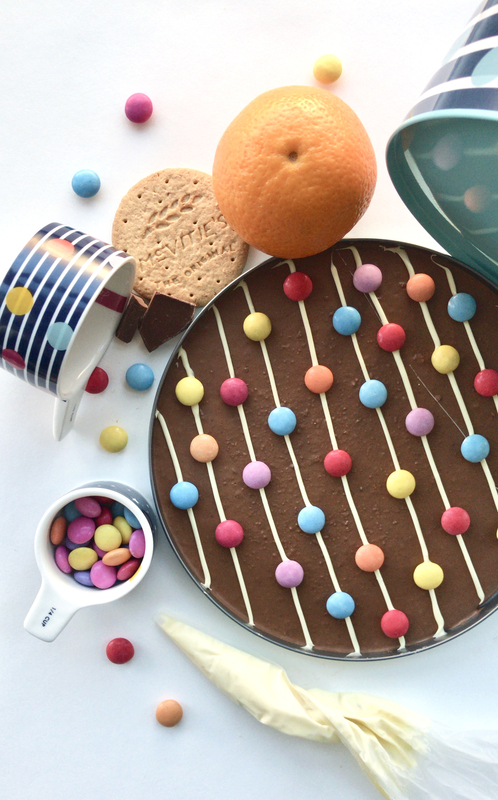 Ahead of tonights Great British Bake off Final, I had teamed back up with Joules. The company I worked for as their baby toddler designer, before going on the show. It was my friends and colleagues there that were really responsible for me applying, placing multiple application forms on my desk! From naming colour palettes after food and adding bakes to mood boards and selection meetings, I guess I was always combining my two passions for design and baking together, even before walking into that tent. Joules were always so encouraging and supportive through it all and is therefore lovely to now be designing a recipe for them 5 years after winning and secret squirrel cakes and giant jam sandwich cakes first ever got created! I can’t quite believe it’s been 5 years since I won and although I often get asked if I miss working as a designer, I honestly don’t feel I’ve ever really stopped. I’ve just swapped designing with fabric for food and it’s my design roots that very much inspire and feed both my ideas and designs. 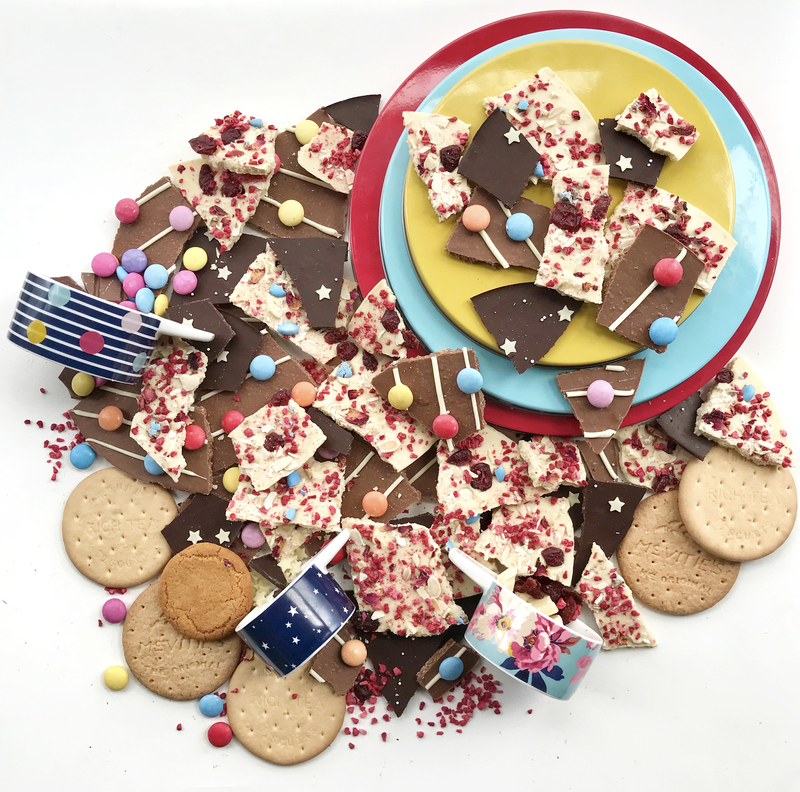 It’s been incredible to work and create bakes for design heroes of mine, from Quentin Blake to the Design Museum, to making David Hockney biscuit glasses for the Tate and florentines for Florence from Florence and the Machine. Life has certainly been both full on and full of exciting experiences and collaborations. Getting to write and release my first book ‘Quinntessential Baking’ with bloomsbury publishing has also been a big highlight, especially as books have always played such a big part in my life, having grown up in my families independent bookshop, Quinns Bookshop based here in Market Harborough, opposite the very first Joules shop! 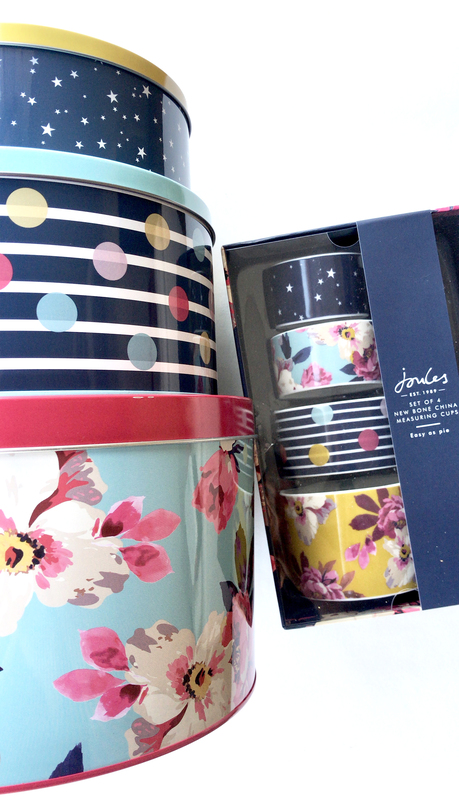 Taking inspiration from the Joules cake tins and colourful prints, sold in the shops and online here, I have crEATed three contrasting chocolate slabs/shards, made within the lids of each tin. 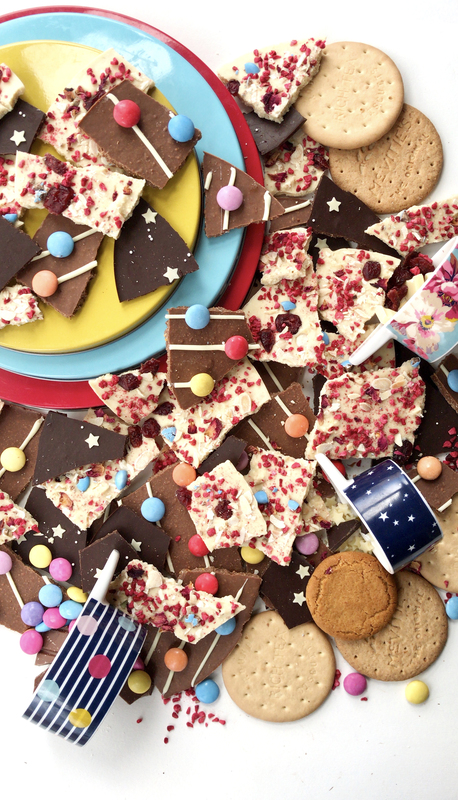 Playing on the idea of a biscuit tin, each slab features a different biscuit, ground up and mixed into the chocolate to add both a pleasing texture and crunch. Chocolate covered biscuits in more than one sense, shard and hopefully cup of tea. Something else I had some what of a reputation for making while at Joules! 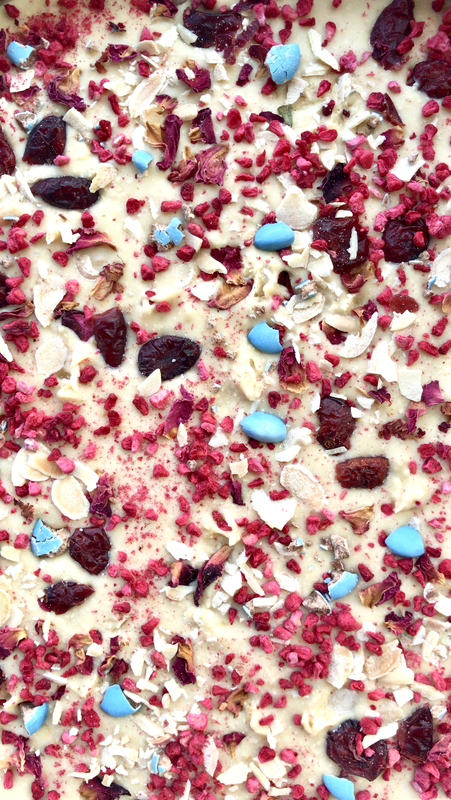 In addition to the biscuits, a variety of citrus zest flavours each slab, complimenting the type of chocolate used. 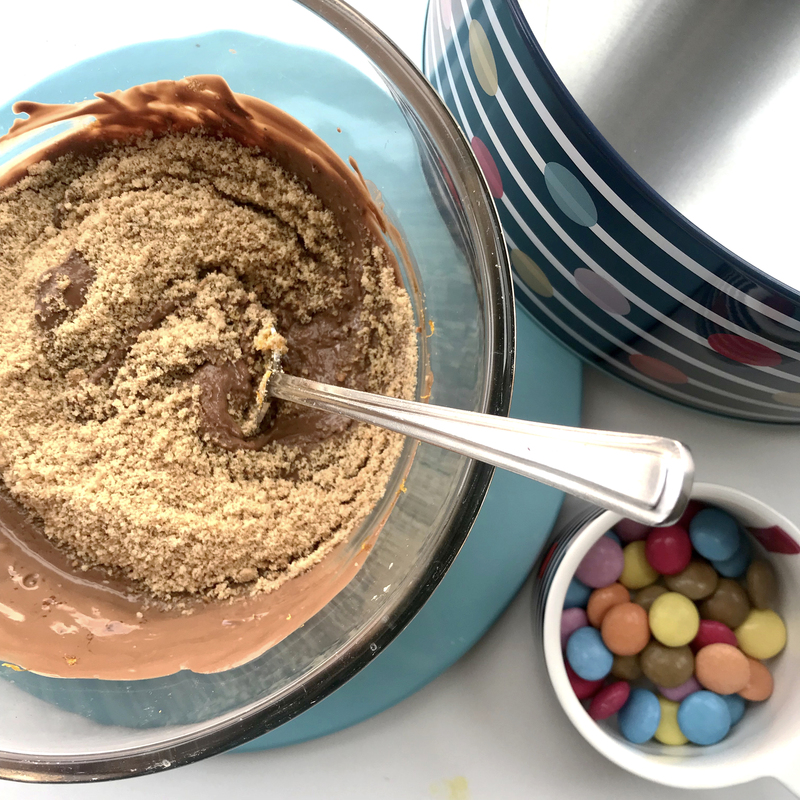 As well as storing them inside the different tins- either separately or mixed up, the chocolates are also the perfect edible treat to give away and decorate bakes with. A few shards can easily transform a simple chocolate cake, vanilla cupcakes or cheesecake for example. Especially if elements from the slabs/shards are scattered on and around the bake. 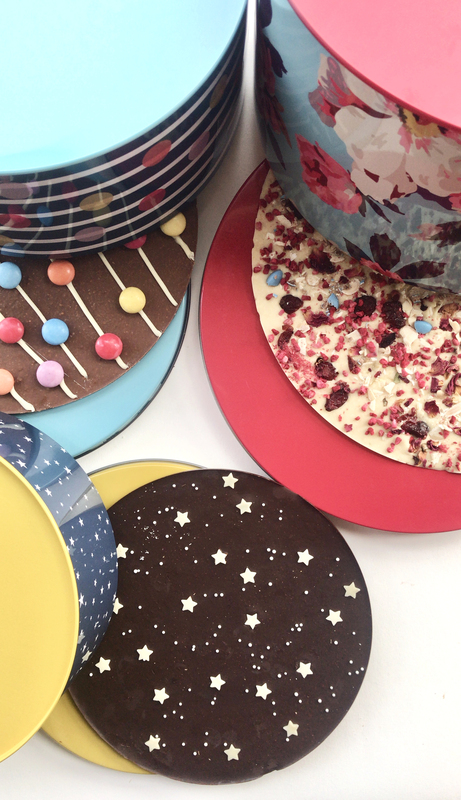 Finally if kept as one whole round, the chocolate slabs can also be used as edible plates to display your bakes on. 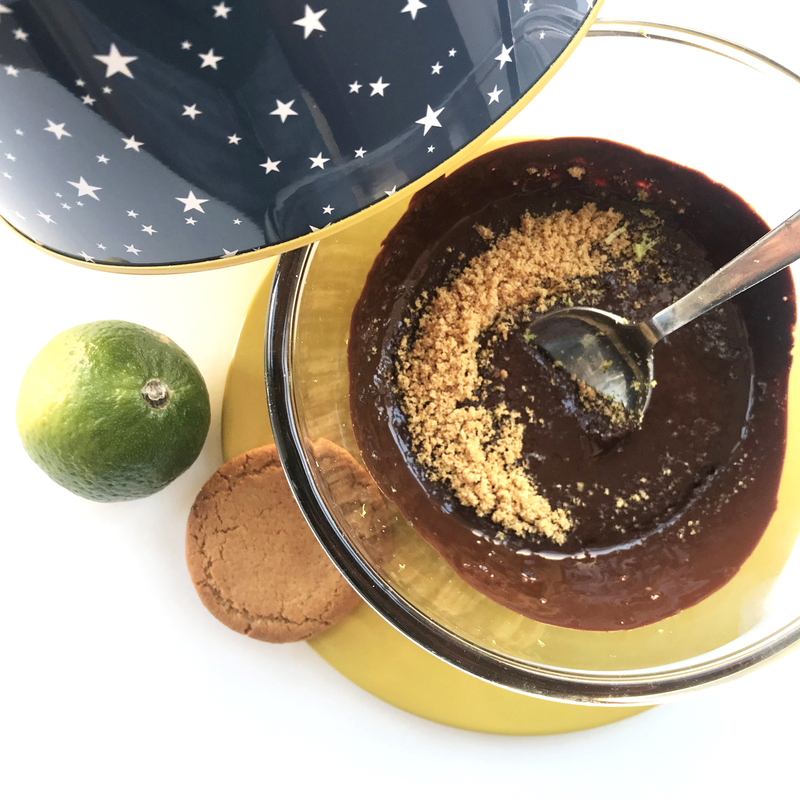 The measuring cups that accompany the tins and prints are also the perfect addition to any kitchen and the largest cup a great alternative to a typical tea cup/mug to enjoy a cuppa in-with a chocolate shard and biscuit! 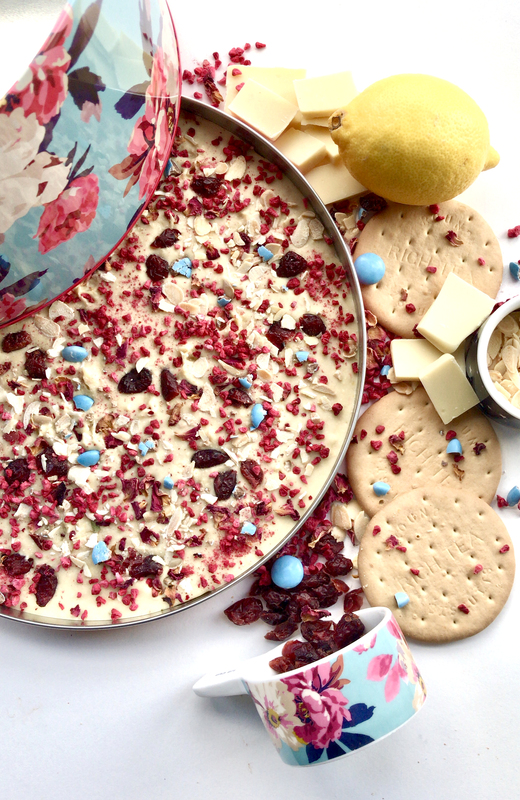 Take your large floral cake tin lid and a sheet of non stick baking parchment and draw around the lid to create a circular piece of parchment to sit inside the tin lid. Break or chop the chocolate into pieces and melt in a bowl set over a pan of gently simmering water or in the microwave set on a low heat, stirring every now and then. Meanwhile blitz the biscuits in a food processor or in a plastic food bag crushed into crumbs using a rolling pin. Transfer the biscuit crumbs into the bowl and zest over the lemon. Stir everything together to combine and tip the mixture into the prepared tin lid easing over the base and to the sides to create a flat even layer. It can help to gently tap the base of the tin on a flat surface to encourage the mixture to reach the edges of the tin. Scatter over your decoration ingredients, then leave somewhere cool or in the fridge to set. Break into shards or leave whole and store inside the tin with more of the biscuits. 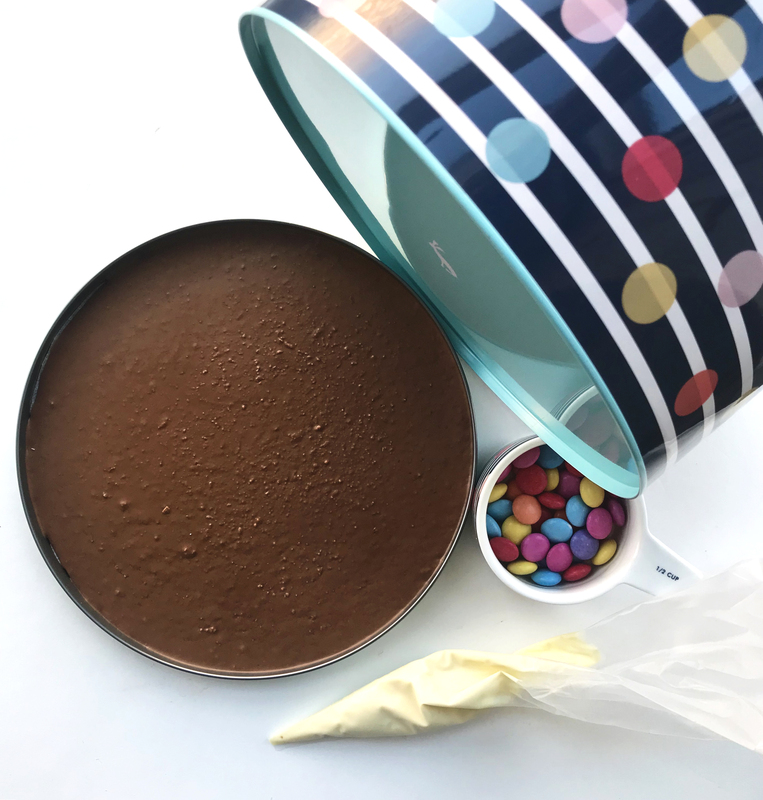 Take your medium spots and stripes cake tin lid and a sheet of non stick baking parchment and draw around the lid to create a circular piece of parchment to sit inside the tin lid. off the piping bag and pipe lines over your milk chocolate mixture in the tin. Next stick your smarties over the lines, following the print on the tin as a reference. Leave somewhere cool or place in the fridge to set. Break into shards or leave whole and store inside the tin with more of the biscuits. 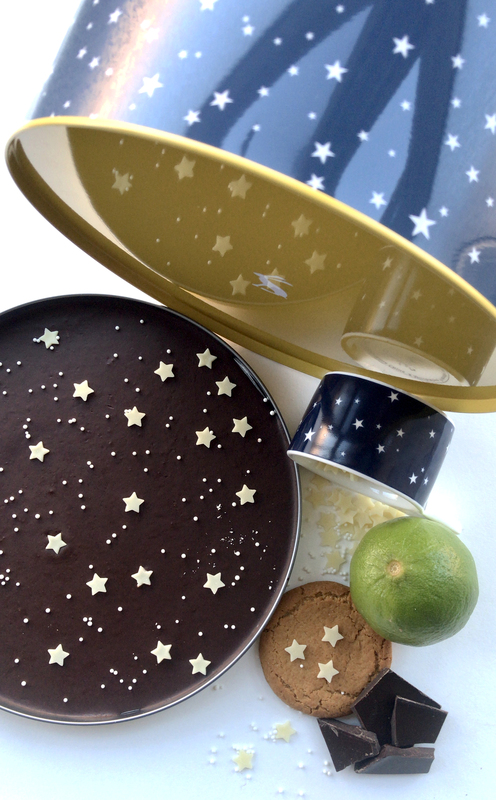 Take your small star print cake tin lid and a sheet of non stick baking parchment and draw around the lid to create a circular piece of parchment to sit inside the tin lid. Break or chop the chocolate into pieces and melt in a bowl set over a pan of gently simmering water or in the microwave set on a low heat, stirring every now and then. Meanwhile blitz the biscuit in a food processor or in a plastic food bag crushed into crumbs using a rolling pin. Transfer the biscuit crumbs into the bowl and zest over the lime. Stir everything together to combine and tip the mixture into the prepared tin lid easing over the base and to the sides to create a flat even layer. It can help to gently tap the base of the tin on a flat surface to encourage the mixture to reach the edges of the tin. Allow to set slightly and cool down, before placing your white chocolate stars on to the surface. If the chocolate is too warm the white chocolate stars will melt into the dark chocolate base. Finally sprinkle over the mini edible pearls, following the print on the tin as a reference. Leave somewhere cool or place in the fridge to set. 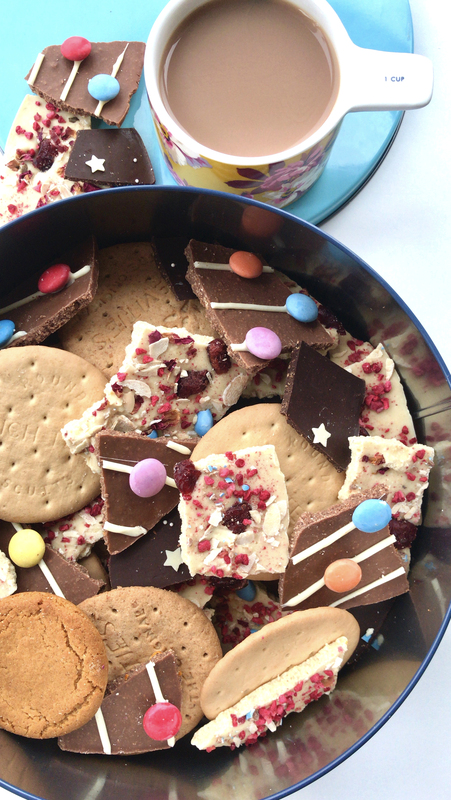 Break into shards or leave whole and store inside the tin with more of the biscuits.